Harley CP Pistons, the best pistons for those that demand the ultimate in engine performance! Harley Davidson Twin Cam pistons for street high performance and racing forged piston kits by CP pistons available here. We have standard bore twin cam pistons as well as big bore twin cam piston kits.CP Pistons Harley twin cam high compression piston kits are also available in several different compression ratios. These forged pistons will work with oversize valves as well as high lift camshafts as they include oversize valve reliefs. Along with the full radius dome designs, high performance piston rings and high strength piston pins, these pistons offer the highest quality and are engineered for maximum power output and dependability. Buy the best forged Harley Twin Cam pistons, buy CP Pistons forged Harley performance pistons. 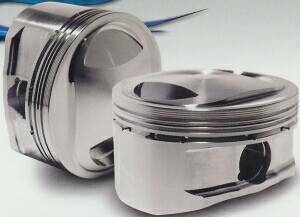 What is included and features of CP Pistons Twin Cam Piston Kits. CP Pistons high performance and racing pistons are used by top professional riders and teams, weekend warriors and street performance enthusiast. Please note: You will need to order a quantity of 2 of the part number piston you select to replace both of your existing pistons with these CP Pistons unless you are just doing a replacement of 1 cylinders existing CP Piston. Each part number listed is for 1 piston, 1 piston pin, 1 cylinders worth of piston rings and 1 set of pin locks. Cometic top end gasket sets are available separately, but are not included with the piston kit. The matching head gasket or complete top end gasket kit for each application is listed in the table. + FREE SHIPPING!Free shipping in the USA for this item when you spend $350.00 or more!International shipping for this item is only $49.95! 4.125 4.625 1.049 10.75-1 -9.5 Special order part, will take approximately 2 weeks to be built from the time we receive your order. Deglaze Cylinder When replacing a piston with the same stock bore size as the original factory stock size you do not need to have your cylinder modified. We do recommend that you deglaze the cylinder. This involves running a hone through the cylinder to remove glazing and provide the best possible surface for piston ring seal. This will improve power and piston and ring life. Bore and Hone Cylinder When installing an oversize, big bore piston, the cylinder must be bored to the correct new bore size to allow installation of your oversize piston. The cylinder then must be finish honed to provide the proper surface for your piston and rings to work in, and provide best power and longevity.